Profitable Productive Blogging: AAfter A Better Moustrap? We all know that in the land of the search engines Google is king. There are a plethora of other search engines out there specializing in specific areas of search such as people, businesses, etc., and most have some good aspects. Well another search engine has joined the fray. The AAfter search engine has a a few options that I really like. One is that the results seem to be just a bit more targeted for many searches than do those from google. I took a couple of screen shots to show you what I mean. In the first picture you can see where I googled zip 46322 and it comes up Hammond, which it isn't it is Highland. After the first google maps result that is wrong anyway the others just don't seem real targeted. In this second picture you can see the results when I typed in the zip 46322 into the AAfter web search engine. You can see that the results are much more targeted and that it actually gets the location correct. It also has quick links to weather, yellow pages, and allergy information for the zip code. To me it makes sense that if you are typing in a zip you would want results that are very targeted. 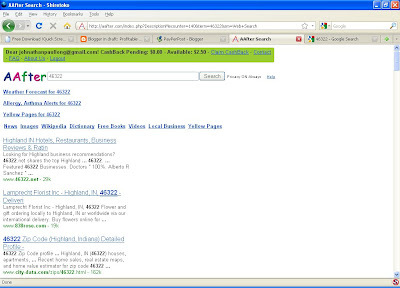 In this case it seems to me that the AAfter web search engine is better and would allow you to find local business faster using AAfter.com search. In this second example you can see a search for the term Tweetdeck. Tweetdeck is a twitter and Facebook front end software program that allows you to better organize and update your social networking sites. Anyway to me it would be that a person searching for Tweetdeck would actually want to check out the software site and possibly download the software. As you can see from the google search Tweetdeck.com doesn't even show up on the first page of results. Pretty dumb if you ask me. 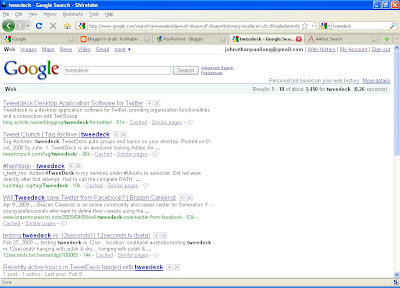 The next picture here shows the AAfter web search engine results for the term Tweetdeck. As you can see Tweetdeck.com is the very first result with the wikipedia article being next. Makes much more sense to me than the google results. It appears that AAfter web search engine returns better more targeted results than google. 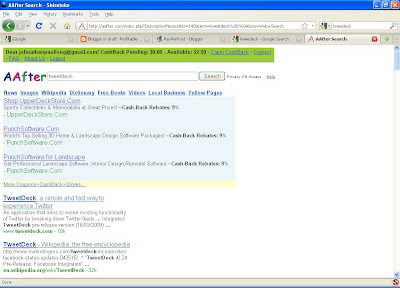 Another nice little feature about the AAfter web search engine is that it has an integrated Cash-Back shopping system. Just type in what you are looking to buy into the AAfter web search engine and the results will show up with the amount of the Cash-Back rebate next the them. You can see an example in the picture above. All three of the sponsored results show a Cash-Back amount. If you click on the link and actually purchase the item you get the shown percentage of your purchase back into your AAfter account. After reaching the minimum of $10 you can request the money via Paypal. They are also putting a free $2.50 into the accounts of new AAfter web search engine users that register for the Cash-Back option. After checking out the AAfter web search engine over the last several days I really like the results I get for a wide variety of searches. I won't use it for all of my searches, but I will use it for quite a bit. One area where I will definitely use it is in combination with price search engines. I can type what I want into the price search engine find the online retailer with the lowest price and then use it in conjunction with the Cash-Back options of AAfter. Anyway just thought I would pass this along. Check it out and see what you think. Have you used AAfter already? What do you think? Have you even heard of the AAfter web search engine?